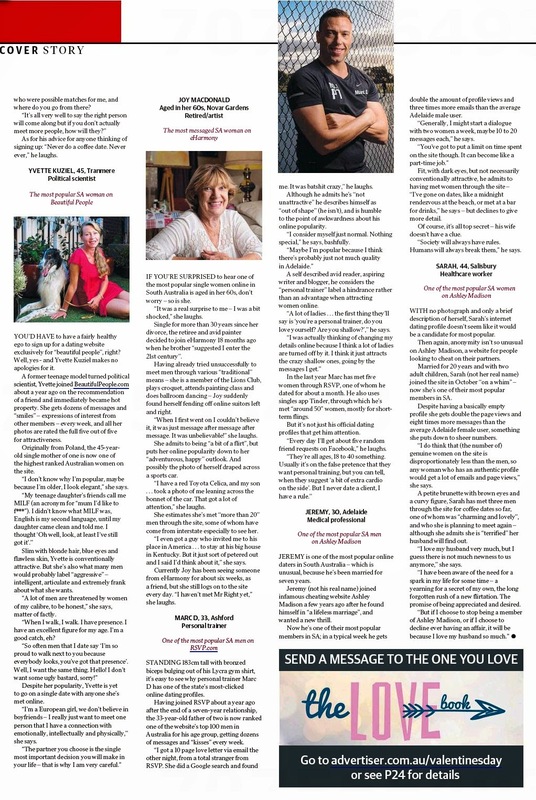 Meet South Australia's most "clicked on" singles in the world of online love. AUSTRALIANS all let us rejoice for we are young and free — and getting ever freer. Fewer of us are getting married while the divorce rate stays constant, and a quarter of Australian households are now occupied by just one person, according to the Australian Bureau of Statistics. 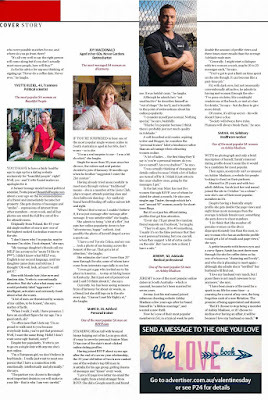 The number of singles is growing across all age groups, and with more people turning to the internet for everything from grocery shopping to banking, it’s no surprise more Aussie singles are joining dating websites hoping to “click” with others — but what’s the competition like? Fierce, as it turns out. 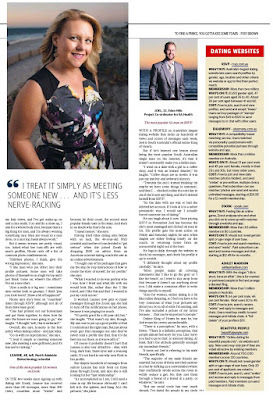 Petra Starke meets South Australia’s most wanted online singles. IF NICOLE’S everyday life mirrored her online one, she’d be mobbed in the street daily by hordes of single men wanting to kiss her. 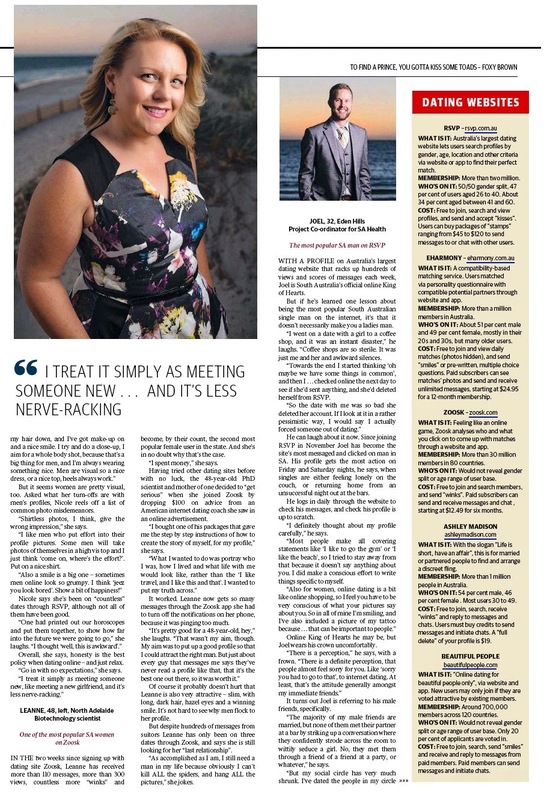 Fortunately for her sanity, not to mention her career as a primary school teacher, her status as the most popular single woman in South Australia is restricted to her internet dating profile, where the “kisses” are virtual. Since joining dating site RSVP three years ago the 37-year-old mother of one has become, by RSVP’s count, the most messaged female member in SA, getting hundreds of profile views and dozens of messages every week. “I don’t get approached (by men) all that often in real life,” she says. When she first signed up to RSVP after divorcing her husband of 10 years, Nicole admits she had “absolutely no clue” what she was doing. But after reading up on online marketing she now treats her profile a bit like a brand, updating it regularly to keep it fresh. “You are, I guess, a product, and you want to be shown as a good product, you want to show people that you’re worth it,” she says. “I use a bit of humour, that’s a definite big thing for guys. I like to show that I’m independent, loyal, trusting. ‘Affectionate’ is a good keyword to use. But it seems women are pretty visual, too. Asked what her turn-offs are with men’s profiles, Nicole reels off a list of common photo misdemeanours. “Shirtless photos, I think, give the wrong impression,” she says. “I like men who put effort into their profile pictures. Some men will take photos of themselves in a high vis top and I just think ‘come on, where’s the effort?’. Put on a nice shirt. Nicole says she’s been on “countless” dates through RSVP, although not all of them have been good. “One had printed out our horoscopes and put them together, to show how far into the future we were going to go,” she laughs. Overall, she says, honesty is the best policy when dating online — and just relax. “Go in with no expectations,” she says. IN THE two weeks since signing up with dating site Zoosk, Leanne has received more than 110 messages, more than 300 views, countless more “winks” and become, by their count, the second most popular female user in the state. And she’s in no doubt why that’s the case. “I spent money,” she says. Having tried other dating sites before with no luck, the 48-year-old PhD scientist and mother of one decided to “get serious” when she joined Zoosk by dropping $100 on advice from an American internet dating coach she saw in an online advertisement. “I bought one of his packages that gave me the step by step instructions of how to create the story of myself, for my profile,” she says. It worked. Leanne now gets so many messages through the Zoosk app she had to turn off the notifications on her phone, because it was pinging too much. “It’s pretty good for a 48-year-old, hey,” she laughs. Of course it probably doesn’t hurt that Leanne is also very attractive — slim, with long, dark hair, hazel eyes and a winning smile. It’s not hard to see why men flock to her profile. But despite hundreds of messages from suitors Leanne has only been on three dates through Zoosk, and says she is still looking for her “last relationship”. “As accomplished as I am, I still need a man in my life because obviously I can’t kill ALL the spiders, and hang ALL the pictures,” she jokes. 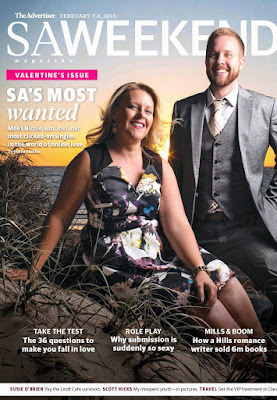 WITH A PROFILE on Australia’s largest dating website that racks up hundreds of views and scores of messages each week, Joel is South Australia’s official online King of Hearts. But if he’s learned one lesson about being the most popular South Australian single man on the internet, it’s that it doesn’t necessarily make you a ladies man. “I went on a date with a girl to a coffee shop, and it was an instant disaster,” he laughs. “Coffee shops are so sterile. It was just me and her and awkward silences. “Towards the end I started thinking ‘oh maybe we have some things in common’, and then I ... checked online the next day to see if she’d sent anything, and she’d deleted herself from RSVP. He can laugh about it now. Since joining RSVP in November Joel has become the site’s most messaged and clicked on man in SA. His profile gets the most action on Friday and Saturday nights, he says, when singles are either feeling lonely on the couch, or returning home from an unsuccessful night out at the bars. He logs in daily through the website to check his messages, and check his profile is up to scratch. “I definitely thought about my profile carefully,” he says. “Most people make all covering statements like ‘I like to go the gym’ or ‘I like the beach’, so I tried to stay away from that because it doesn’t say anything about you. I did make a conscious effort to write things specific to myself. Online King of Hearts he may be, but Joel wears his crown uncomfortably. “There is a perception,” he says, with a frown. It turns out Joel is referring to his male friends, specifically. “The majority of my male friends are married, but none of them met their partner at a bar by striking up a conversation where they confidently strode across the room to wittily seduce a girl. No, they met them through a friend of a friend at a party, or whatever,” he says. “But my social circle has very much shrunk. I’ve dated the people in my circle who were possible matches for me, and where do you go from there? As for his advice for anyone thinking of signing up: “Never do a coffee date. Never ever,” he laughs. YOU’D HAVE to have a fairly healthy ego to sign up for a dating website exclusively for “beautiful people”, right? Well, yes — and Yvette Kuziel makes no apologies for it. A former teenage model turned political scientist, Yvette joined BeautifulPeople.com about a year ago on the recommendation of a friend and immediately became hot property. She gets dozens of messages and “smiles” — expressions of interest from other members — every week, and all her photos are rated the full five out of five for attractiveness. Originally from Poland, the 45-year-old single mother of one is now one of the highest ranked Australian women on the site. “I don’t know why I’m popular, maybe because I’m older, I look elegant,” she says. Slim with blonde hair, blue eyes and flawless skin, Yvette is conventionally attractive. But she’s also what many men would probably label “aggressive” — intelligent, articulate and extremely frank about what she wants. “A lot of men are threatened by women of my calibre, to be honest,” she says, matter of factly. “When I walk, I walk. I have presence. I have an excellent figure for my age. I’m a good catch, eh? Despite her popularity, Yvette is yet to go on a single date with anyone she’s met online. “I’m a European girl, we don’t believe in boyfriends — I really just want to meet one person that I have a connection with emotionally, intellectually and physically,” she says. IF YOU’RE SURPRISED to hear one of the most popular single women online in South Australia is aged in her 60s, don’t worry — so is she. “It was a real surprise to me — I was a bit shocked,” she laughs. Single for more than 30 years since her divorce, the retiree and avid painter decided to join eHarmony 18 months ago when he brother “suggested I enter the 21st century”. Having already tried unsuccessfully to meet men through various “traditional” means — she is a member of the Lions Club, plays croquet, attends painting class and does ballroom dancing — Joy suddenly found herself fending off online suitors left and right. “When I first went on I couldn’t believe it, it was just message after message after message. It was unbelievable!” she laughs. She admits to being “a bit of a flirt”, but puts her online popularity down to her “adventurous, happy” outlook. And possibly the photo of herself draped across a sports car. “I have a red Toyota Celica, and my son ... took a photo of me leaning across the bonnet of the car. That got a lot of attention,” she laughs. She estimates she’s met “more than 20” men through the site, some of whom have come from interstate especially to see her. “I even got a guy who invited me to his place in America ... to stay at his big house in Kentucky. But it just sort of petered out and I said I’d think about it,” she says. Currently Joy has been seeing someone from eHarmony for about six weeks, as a friend, but she still logs on to the site every day. “I haven’t met Mr Right yet,” she laughs. STANDING 183cm tall with bronzed biceps bulging out of his Lycra gym shirt, it’s easy to see why personal trainer Marc D has one of the state’s most-clicked online dating profiles. Having joined RSVP about a year ago after the end of a seven-year relationship, the 33-year-old father of two is now ranked one of the website’s top 100 men in Australia for his age group, getting dozens of messages and “kisses” every week. “I got a 10 page love letter via email the other night, from a total stranger from RSVP. She did a Google search and found me. It was batshit crazy,” he laughs. Although he admits he’s “not unattractive” he describes himself as “out of shape” (he isn’t), and is humble to the point of awkwardness about his online popularity. “I consider myself just normal. Nothing special,” he says, bashfully. A self described avid reader, aspiring writer and blogger, he considers the “personal trainer” label a hindrance rather than an advantage when attracting women online. “A lot of ladies ... the first thing they’ll say is ‘you’re a personal trainer, do you love yourself? Are you shallow?’,” he says. In the last year Marc has met five women through RSVP, one of whom he dated for about a month. He also uses singles app Tinder, through which he’s met “around 50” women, mostly for short-term flings. But it’s not just his official dating profiles that get him attention. “Every day I’ll get about five random friend requests on Facebook,” he laughs. JEREMY is one of the most popular online daters in South Australia — which is unusual, because he’s been married for seven years. Jeremy (not his real name) joined infamous cheating website Ashley Madison a few years ago after he found himself in “a lifeless marriage”, and wanted a new thrill. Now he’s one of their most popular members in SA; in a typical week he gets double the amount of profile views and three times more emails than the average Adelaide male user. “Generally, I might start a dialogue with two women a week, maybe 10 to 20 messages each,” he says. Fit, with dark eyes, but not necessarily conventionally attractive, he admits to having met women through the site — “I’ve gone on dates, like a midnight rendezvous at the beach, or met at a bar for drinks,” he says — but declines to give more detail. Of course, it’s all top secret — his wife doesn’t have a clue. “Society will always have rules. Humans will always break them,” he says. WITH no photograph and only a brief description of herself, Sarah’s internet dating profile doesn’t seem like it would be a candidate for most popular. Then again, anonymity isn’t so unusual on Ashley Madison, a website for people looking to cheat on their partners. Married for 20 years and with two adult children, Sarah (not her real name) joined the site in October “on a whim” — now she’s one of their most popular members in SA. 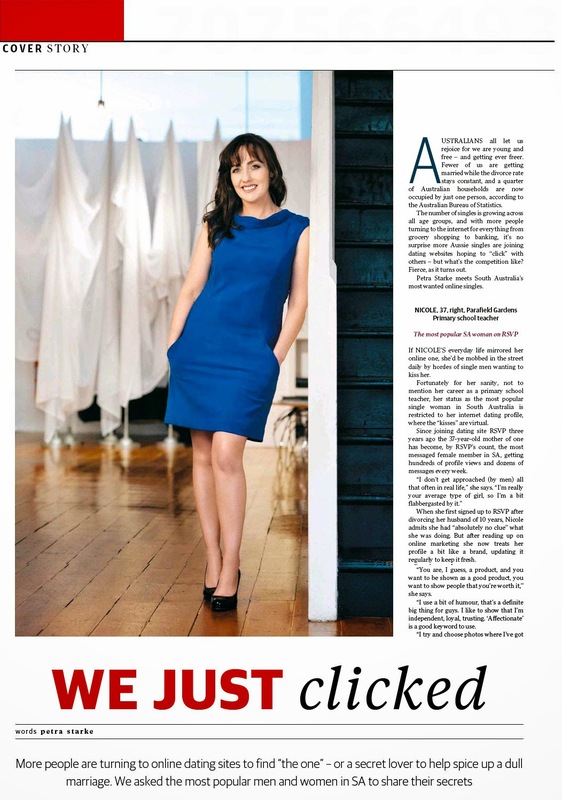 Despite having a basically empty profile she gets double the page views and eight times more messages than the average Adelaide female user, something she puts down to sheer numbers. “I do think that (the number of) genuine women on the site is disproportionately less than the men, so any woman who has an authentic profile would get a lot of emails and page views,” she says. A petite brunette with brown eyes and a curvy figure, Sarah has met three men through the site for coffee dates so far, one of whom was “charming and lovely”, and who she is planning to meet again — although she admits she is “terrified” her husband will find out. “I love my husband very much, but I guess there is not much newness to us anymore,” she says. “I have been aware of the need for a spark in my life for some time — a yearning for a secret of my own, the long forgotten rush of a new flirtation. The promise of being appreciated and desired. This is only an extract of the full article. CLICK HERE to read the full article online. 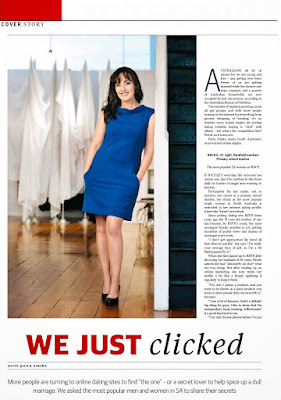 First published in SA Weekend magazine, February 7, 2015.